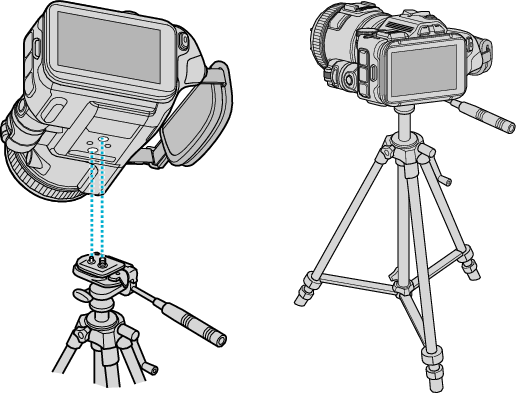 This unit can be mounted on a tripod (or monopod). This is useful for preventing camera shake and recording from the fixed position. To prevent this unit from falling off, check the tripod mounting screw holes and positioning holes on the unit carefully before mounting, and turn the screws until they are fastened firmly. To prevent injuries or damages which may result if this unit falls off, read the instruction manual of the tripod (or monopod) to be used and make sure that it is securely attached. It is recommended to use a tripod or monopod when recording in conditions prone to camera shake (such as in dark places or when zoomed to the telephoto end). Set the image stabilizer to “OFF” when using a tripod for shooting.